There are many types of halva, especially in the middle eastern countries. My own particular favourite is from Constantinople in Turkey, but obviously I can't put the recipe for that in a blog with authentic Greek recipes! In Greece we have Macedonian Halva from northern Greece - a hard halva - but the manufacturers keep the recipe a secret. 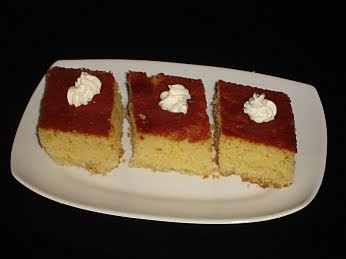 We also have Halva tis Rinas (Rina's Halva) and that is the recipe that follows. Ideally it is served with some whipped cream on top, but that is optional. Put the yolks and the sugar in a mixer and beat well. Add the lemon rind and the milk and continue beating for a short time. In another bowl mix the semolina, vanilla essence, baking powder and grated almonds and then add them to the yolk and sugar mixture. Transfer the mixture to a mixing bowl and rinse and dry the mixer bowl well. Put the egg whites in the mixer bowl and with the appropriate mixer head beat them into a loose meringue in the mixer. Gradually transfer this to the first mixture and fold it in. Grease a 30cm oven dish, 6cm deep and pour all the mixture into it. Bake in a pre-heated oven at 180 degrees Celsius for 30 minutes until it is a golden brown. While the halva is in the oven, prepare the syrup - Put all the syrup ingredients in a pan and boil for 5 minutes. When you remove the halva from the oven, allow it to cool a little and then cut it into portions in the dish. Pour the syrup all over it. Cover it and allow it to rise while it is cooling. 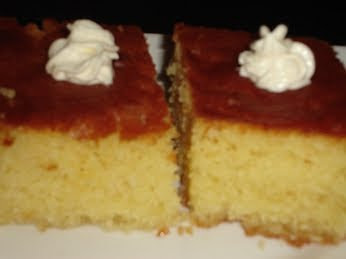 When it has cooled completely, serve the portions with a little whipped cream on top.